At the beginning of the 20th century artists and intellectuals were deeply influenced by the work of Friedrich Nietzsche, an atheist philosopher who rejected traditional values of Christianity to forward the notion that ‘God is dead.’ However, many German Expressionist artists were creating biblically themed prints. To express their deep resistance to traditional art the Expressionists used a medium that was part of their long German history – the woodcut. They also turned to the primitive art of Africa as a model to escape the artistic past of the West, finding a way to merge the primitive and contemporary. This influence is immediately seen in Schmidt-Rottluff’s Christ among the Women, in which the women have distinctly African appearances. The artist did not depict Jesus surrounded by his disciples, but in this striking woodcut places Christ among the women. Why women, rather than the men closest to him who had traveled the roads of Galilee and followed him to Jerusalem? Who are these women? It is easy to identify Jesus with waves of light radiating from his head in the mandorla form that surrounds his torso. 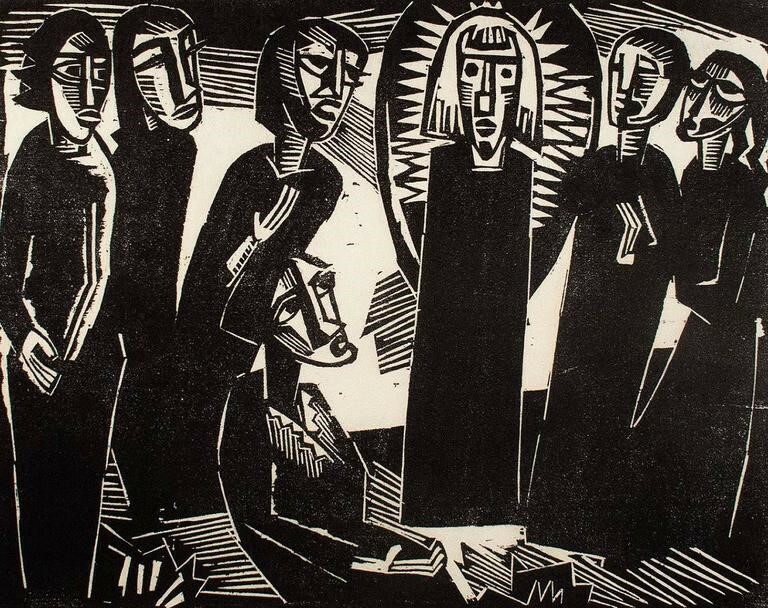 But who are the statuesque female figures who stand with Jesus in Schmidt-Rottluff’s woodcut? We can only imagine who Schmidt-Rottluff included, but we can cull a possible list from Jesus’ encounters with the many women he associated with in the Gospels. The arrangement of the figures places Jesus as the central figure; each woman has a unique stance, several holding out their hand while one leans in to hear more clearly. Their African mask-like-faces belie defining clear expressions, but each has her attention focused as if in conversation with Christ, who shares an equally stylized mask-like face identifying with them. Women played a prominent role in the life of Jesus. We would assume that Mary, his mother, who not only gave birth to him but followed him to the foot of the cross, would be among these women. The Gospels (John 4:1-3) tell us that Jesus was radically egalitarian, casting aside social taboos, one of which was that Jews do not associate with Samaritans. Yet he engaged in a conversation with a Samaritan woman asking her to draw water for him to drink. According to Luke several women accompanied Jesus and his disciples, some helping to finance his ministry, two of whom were Joanna and Suzanna. The list could not possibly exclude Mary Magdalen who had been cured of seven demons and became a faithful follower of her Savior. Who is the woman seated at the feet of Jesus? Could this be Mary who sat at Jesus’ feet, with Martha her sister standing behind her? These were two women with whom Jesus found comfort and strength. Or is this the woman caught in adultery or the woman who touched the hem of his garment? Two of the three people Jesus raised from the dead were women. The list continues of women who Schmidt-Rottluff might have included in the circle of women supporting and comforting the Lord. Jesus stands firm in the middle of the women. He looks out to us, perhaps asking if we are among those who will also stand with him. Karl Schmidt-Rottluff: Christus unter den Frauen (Christ among the Women), 1919, woodcut, 15 ½ x 19 ¾ cm. Karl Schmidt-Rottluff (1884 – 1976) was a German painter and printmaker, who helped to form the Die Brücke group in Dresden in 1905. Originally an architect student, he turned to painting. Influenced by cubism and African art he first created rural landscapes and nudes, but after serving in World War I, with his nerves shattered, he turned to woodcut prints many of which were biblical subjects. Between 1905 and 1926 he created 650 works, of which over 450 were woodcuts. Rottluff was expelled from the Prussian Academy of Arts, and the Nazis seized over 600 of his works from public collections. Nevertheless hundreds of his woodcuts have been preserved and offer us intense and powerful insights into many Bible stories. Sandra Bowden is a painter and printmaker with over 100 solo exhibitions. She is a passionate collector of religious art and curates exhibitions from her collection. Sandra was president of CIVA and was trustee of the MOBIA. She studied at Massachusetts College of Art and received her BA from the State University of New York. Christ among the Women is a woodcut from a new exhibition, Was God Dead? Biblical Imagination in German Expressionist Prints that will open January 2019 at the Calvin Instutute for Christian Worship in Grand Rapids, MI. For more information on Sandra Bowden go to www.sandrabowden.com and www.bowdencollections.com.